I hope that you have all seen the latest edition of the Hayling Trader which officially launched our Transport Fund with a target of £20,000 in order to purchase a Van and a new trailer to help with equipment transport to our many activities and camps. This is the logo for the appeal designed by John Clayton, the editor of the Hayling Trader and you should start to see many of these posters around the Island. John decided that we should call this the "£1 per Head" appeal because if we can raise £1 for every person living on the Island, we will be very close to our target. At the time of writing this edition of "The Woggle", our appeal already stands at £2,300. Congratulations to Godfrey Knight, Joan Roberts and Sandra Haines who each won £25 in the February draw. Thank you to those of you who have already renewed or joined the 100 Club for the next 12 months (starting in April). This year all profits from this Club will be added to our Transport Fund. If every family joined, our transport fund would benefit from over £2000 - so please consider joining if you can. Advance notice that this year we will be holding a Group Camp between Friday June 24th and Sunday June 26th. Cubs, Scouts and Explorers will be camping for the whole weekend and the Beavers are invited to join us for the Saturday and Sunday, but not sleeping over. Details after Easter. The Young Leader Award can be gained by anyone aged 14 to 18 who chooses to help regularly with one of our sections. In addition to their weekly commitment, they also undergo training in a range of leadership skills, planning and also First Aid and managing behaviour. Congratulations to Jake Whistlecraft, Oliver Tonkin, Jack Allison, Rob Durrell, Barnabas Pycroft, Becky Chapman, Roberta Allgood, Genny Davis and Brynmore Day shown above and Chelsea George and Mike Kenny not in the photograph. Our newly formed Service Crew spent their first meeting helping with some much needed attention to the outside of the HQ. The gutters are now clear of leaves, the grass cut, the verges trimmed and some general tidying up completed. Thank you very much to Geoff and the team. To join our Service Crew just visit our website. 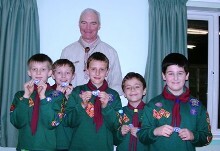 In two separate presentations, 7 members of Jupiter Pack received their award, the top award of the Cub Scout Section. Scott Mitchell, Craig Cooper, Callum Heathcote, Douglas James and George Pickering all received their awards from Ian Stott the District Commissioner who praised the Cubs for their achievements and thanked the parents and leaders for their support. 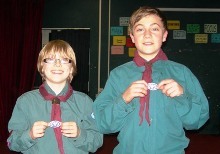 A couple of days later, Charlie Ellis and Reuben Knight who have now moved onto the Scorpion Scout Troop, received their award during a troop meeting from Mandy Hawke, District Cub Scout Leader. 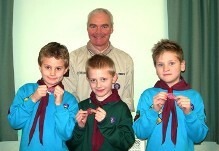 Elliot Cotton, Alex Hawkey and Edward Charlton of Redwood Beaver Colony were presented with their top award, the Chief Scout's Bronze Award by Ian Stott. Congratulations to Linda Hunter, leader of Redwood Beaver Colony who received her 10 year Adult Service Award and Tom Lincoln Assistant Scout Leader with Lion Troop who received his 5 year Service Award. The awards were presented by Ian Hawke Group Scout Leader who thanked Linda and Tom for all they have done plus all they continue to do. One of the challenges about meeting away from our HQ is that many of the normal items of equipment are not readily available, for example the Cub Scout Flag used when investing new Cubs. With thanks to Ema Johnson this problem has been solved for Saturn Pack who now have their very own special flag. It was very appropriate that Ema's son Sam was the first Cub to be invested with this new flag. Thank you Ema. Well done to Saturn Pack who entered two teams in the Havant District Football competition recently. Saturn "A" team finished 3rd and the "B" team 4th. 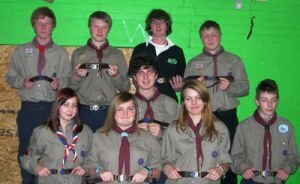 14 Cubs and 6 Leaders took part in a sleepover at the HQ. During the weekend the Cubs completed the Artist badge by having a go at Tie Dying, painting and drawing. During the weekend they cooked their own meals. Congratulations to Ed Harrison Leader of Eagle Scout Troop and Claire Patterson who recently became engaged. 20 Leaders recently completed their 3 year assessment for First Response Training. Rightly so, we are obliged to hold current certificates for this and Safeguarding Children. As part of our ongoing training, we held our own workshop on the subject of Challenging Behaviour. These are a good opportunity to learn some different approaches and share our own experiences. Thanks to Fiona Jordan Harrison for leading us.. It is great to announce that we have just received an award from the County Councillor Community fund for £2000 towards our Transport Fund. We are very grateful to Frank Pearce the County Councillor for Hayling Island for his support with our application.